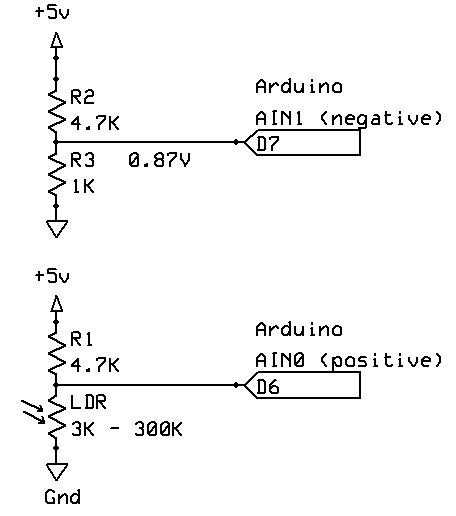 I am trying to find some information on how to use the analog comparator on an Atmega328 to detect when an analog pin has reached a certain voltage (3.16 volts). I cannot find any example code that says how to do this, although I have read that the analog comparator can compare the voltage on an analog pin with the voltage output by a PWM pin. I do not understand how this would work as the PWM pins do not output an analog voltage, but a pulse width modulated square wave. Is it possible to use the comparator to compare with a certain voltage this way? I have tried polling with analogRead(), but it is too slow for my application. You need a low-pass filter between the PWM output and the comparator input. This will allow you to produce an analog voltage from the PWM output, which can the be used as a reference voltage for the comparator. Typically, a simple RC LPF is sufficient. Choose a large time constant relative to your PWM frequency (the Arduino defaults to 490Hz) so that you don't have ripple in your reference voltage. Not the answer you're looking for? Browse other questions tagged atmega328 analogwrite or ask your own question. Does the VCC Output pin always give out a consistent 5V Voltage supply? What is the current output?